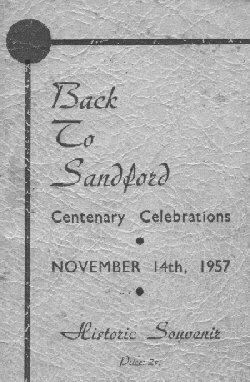 The historic information on this page is from a transcription of the souvenir booklet produced by the Book Committee of the Sandford Progress Association for the Back-To Sandford Centenary Celebrations of 14 November, 1957. Their efforts are, and will be appreciated by both present and future generations. Mrs . A. JONES, Mrs J. WIDDICOMBE, Mr. R. STURGESS, Mr. A. McKINNON. In endeavouring to record a short and concise history of the early days of Sandford and the people who pioneered the district, we are indebted to the late Mrs M. I Grogan for a valuable manuscript which she compiled during her years as a teacher in the local school, and from which we have taken much of the contents of the booklet. Mrs, Grogan, herself a daughter of one of the pioneers, will be remembered by many of the pupils who passed through her hands, as a gifted teacher. Sandford - this little township nestled in the Wannon River valley, surrounded by rolling green hills which reflect their contribution to the nation's wealth, came into being just one hundred years ago. It is with pride that we present this souvenir centenary booklet as a tribute to the stout - hearted pioneers who knew only the hard way, and whose spirit is typified in the words of the poem printed in the following pages. The poem was written in 1930 by Mr. F. R. Cox, himself the son of a well-known pioneer. We hope that all who read this book will treasure it as a memento of a proud little community. of the time when the highway was just a bush track. And quickened the schedule for Casterton - Portland. And Brown would pull Smith from a bog in the morrow. It just seemed both teams disappeared in the ground. 'Ere the welcome appearance of Kerr with the strays. And the times of the old "Rising Sun". People lined Up from every conceivable angle. Made the barrels look right when received at the Pub. With bush tracks to travel, and bulk on the wagon. We travel in comfort in these latter years. Just think of your fathers, and let that be enough. Major Mitchell and his party first traversed the undulating country surrounding the present township of Sandford on the 11th August, 1836. After having crossed the Wannon River, to the west of the new flourishing Sandford House Soldier Settlement Estate, Major Mitchell crossed the hills and named this part of Victoria, Australia Felix. The country was then occupied by tribes of aborigines, until in 1837, the Messrs. Edward, Frank, and John Henty, came from Portland on the advice of Major Mitchell. Greatly impressed, they selected the land, which was subdivided into the three largest stations in the district, namely Munthum, Merino Downs and Sandford House. Munthum Estate, comprising some 77,000 acres of rich pasture land, valued at �2 per acre, was purchased by Mr. Edward Henty, who settled there. Merino Downs contained approximately 16,000 acres and it was purchased by Mr. Frank Henty. It was at "Sandford House" that Mr. John Henty made his home, with its 6,000 acres of verdant rolling hills. The name of Sandford was given to the little village when it was surveyed in 1856. Early residents claimed that it was so named after the sandy ford used by Major Mitchell to cross the river at the Northern Boundary of Sandford Estate but later inquiries seem to indicate that the village was in all probability named by Mr. John Henty, after an old spot known to him in England. On 11th June, 1847, "Sandford House" was taken over by Mr. J. H. Jackson who came from his uncle's station at Sunbury with a sound knowledge of sheep breeding. This was most useful for the district was especially suited for the production of wool. After the passing of the "Land Act" in 1861, a land board met at Casterton, and an influx of settlers shortly after brought about an increase of trade and business in the little township, which really came into existence in 1857. In that year Messrs. Waddely and John Scott Grant each built an hotel, the former naming his Sandford Hotel, and the latter called his the Caledonian Hotel. Mr. Charles Grinham also opened a store that year, and Mr Tom Somerville and his wife arrived in 1857. Scattered tribes of aborigines still remained in the district and became very friendly. "Yorkie", Peter, "Tiger", and Jim Powers and his lubra Tonie, were well-known. The last corroboree was held on Craigs Hill. The last encampment of mia-mias was near the bend of the railway line entering the north side of Sandford. It is interesting to note that the Shire Council originally started at Sandford in a small brick building, and had for its secretary, "Bombay" Smith, so named as he came from India. The place of meeting was later changed to Casterton much to the disgust of Sandford residents. In 1866 Mr. Layley settled in Sandford as a shoemaker, and in 1867 he opened a general store. In 1873 Mr. Layley had the honour of laying the foundation stone of the Rechabite Hall. This hall was afterwards sold to the Ancient Order of Forresters and it is still known by that name. On June 21st, 1887, the late Mr. J. S. Anderson planted an oak tree in front of the hall. This was to commemorate the 50th Jubilee of the late Queen Victoria, and has now grown into a magnificent and much-prized specimen. Sandford owes its indebtedness to the late Mr. J. S. Anderson for the library. Through his love of reading;, he established "penny readings" in the first place of amusement erected in Sandford, known as Nicholls Hall, opposite the old Nicholls home. The money he thus raised formed the nucleus of the present library in the Mechanics Hall. The foundation stone for this was laid in 1885 by the late Mr. W. M. Bond, landlord and licensee of the Commercial Hotel. Flour-mllling; was started here by the Miller Bros. fron Coleraine, but being unsuccessful they sold out to the late Mr. Peter Learmonth. He engaged Mr. John Holmes as manager, and later his brothers George and William, joined him. Eventually they purchased the mill, and built up a reputation for the high-quality, stone-ground, silk-dressed flour. Their industry boomed, but with the introduction of roller-milling Holmes Bros. moved to Casterton. This body was formed in 1951 with the object of working for town improvements and amenities. Much good purpose has been served and the Association is now an established body in the district. Through the efforts of the Association, the 1914-18 War Memorial has been renovated, and an imposing spire added. Names of those who served in the 1939-45 have been engraved on the south side of the stone The area has been enclosed with a steel and concrete fence and has been planted with shrubs. A concrete path was recently laid from thewrought-iron handgate to the base of the Memorial. A very fine avenue of Desert Ash has been planted from Murrell's Bridge to the Post Office. This will be extended yearly. All trees are thriving and this year we should see a glimpse of their future beauty. Street seats have been installed and many requests to the council have all had favourable results. The main project of the Association at the moment is the construction of a sports arena at the Recreation Reserve. This will involve the filling in of a large depression, but a grant has been approved to enable some progress to be made at an early date. Mr. I. Finlay's drapery shop at Sandford. Sandford House and Merino Downs were the only buildings between Dunrobin and Portland in 1841. The railway was opened on 1884, and took two years to construct to Branxholme, greatest difficulty being the cutting near Sandford. That Sandford once was graced with some two-storied buildings. The closing of Hornibrook's Caledonian Hotel on New, Year's 1908, - beer at 3d. a pint - and later in the night, just given away. First motor car in Sandford was driven by Mr. Wilkes from S.A. In 1905 he drove through here to Visit relations at Mordun Hill. First Sandford resident to own a car was Mr. H. B Jackson of Sandford House. This was a 1903 model Ford. Annual rent for grazing rights of Racecourse in 1895 was �26/10/ -. Today's price, �300. Engineer Scott's fees for survey, preparing plans and specifications for racecourse - �1/11/6. Sandford once had a boarding-house. Mr. Nichollsls' drag and five-in-hand used to convey residents to Casterton for shopping. If ever the hall tumbles down there will be found in a bottle on the far corner on the chapel side, the names of all those who took a leading part to get the hall. In 1864, at a committee meeting, it was decided to build a hall and the secretary, Mr. J. S. Anderson, was instructed to call tenders in The "Casterton News". While on his way to Casterton he met the late Mr. W. Diwell, senr., and in a conversation Mr. Diwell advised Mr Anderson not to put it in the paper, but go back and call a special meeting of the committee and put his views before them, which the secretary did. The committee accepted Mr Diwell',s offer and tenders where called in The "Casterton News" for a brick hall at Sandford, and the late Mr. Jas. McCormack vas the successful tenderer. So only for the secretary meeting Mr. Diwell, the hall would have been a wooden building instead of a brick building. Plans of the proposed hall were submitted on the 16th February, 1885, and on the 29th March, 1886 the hall was finished in accordance with the requirements of the Act. Visit to Sandford House Settlement. Grand Torchlight Procession - 8 p.m.. Led by Cast. V.R. Band. The Roman Catholic Church was the first place of worship built in the village, and it was completed by the late Jas. McCormack in 1866. Rev. Father Marshall was the first Parish Priest stationed here. In 1883, the Presbyterian Church was opened and Rev. Gillespie, of Coleraine, was the nearest Minister to conduct the services. These stout-hearted pioneers had to rely on horse-drawn vehicles to travel the long distances between churches. The Church of England was opened in January, 1888. The Vicar of Christ Church, Casterton, being first Minister. All these Churches are still functioning. In those early days, churches were packed to capacity and each had a fine choir. Sandford has a proud record of service in two world wars. The fine Memorial situated in the heart of the town is a lasting reminder of the sacrifices made by the young manhood of the district. Names of the fallen, and of all who served are inscribed on the beautiful stone. And they are not forgotten. Each year, an inspiring service is conducted on Anzac Day. W. Jones. T. Preece. H. Preece. A Burnip. S. McConachy. R. McDonald. B. King. H. McCabe. T Oswald. E. Holmes. J. Johnstone, I. McCalman. A. Pretlove. E. Shepherd. H. Stuart. The most important event in the history of the community was the opening of the Common School in 1863. It was built on a sandhill to the south of the township. The money for the purchase of the land and the erection of a substantial brick school and a two-roomed dwelling was donated by private subscription from all the residents. The late Dr. Russell and Mr. J. H. Jackson were the principal movers in the matter of education. Each pupil, according to his class, paid at the rate of 6d., 9d. and 1/ - per week as his education progressed. The first teacher was Mr. Holt. He was followed by Mr. C. H. Radford, son of Doctor Radford who had commenced a practice in Sandford. Shortly after, Mr. T. Evans was appointed school-master, and during his term the Common school was merged with the present school system with the Introduction of free education in 1872. In 1875 it was deemed advisable to move the school to a more central site, and in 1875 a commodius brick school and residence were built in the centre of the growing community. That school is still being used, although a new infant school had to be added in 1908 to cope with the increased attendance. Of recent years the school has been painted and renovated, and equipped with many modern amenities. The planting of trees and many beautiful shrubs was made possible with the provision of a good under-ground water supply. A generous legacy from the estate of the late Duncan McIntosh in 1955 has enabled the school Committee to carry out many improvements and at present a new tennis court fence is under construction. The old shelter-shed has been converted into an up-to-date lunchroom, which is much appreciated by the children, who can now eat their lunches in clean and pleasant surroundings. Present head teacher is Mr. R. Sturgess. This is now known as the Casterton Vice-Regal Band. For many years members of Holmes Bros. families formed a large part of the band. A rabbit-tinning business was carried on in the old mill by Quinto Bros., until the place was mysteriously destroyed by fire. The butter factory was removed about the same time to Casterton, and the reverses experienced have never been overcome. The early settlers did all the business and trade with Portland by means of bullock drays, coach, and horse and cart. As there was no local council, the Portland Road Board had to maintain and look after all used roads. Things were greatly changed with the opening of tile railway line from Branxholme. Today we have excellent bus services and fast-moving cars. A disastrous flood in March, 1946, inundated a large portion of the Sandford township, and hundreds of acres of river flats were covered with an immense volume of water. Nine inches of continuous rain over a short period swelled the Glenelg and Wannon Rivers to unprecedented heights. Loss of stock was tremendous, and homes and buildings were severely damaged. Several families were rescued with difficulty. Sandford Bridge over the Wannon, and Murrell's Bridge were completely submerged. The township was isolated for several days. Residents being rescued on the Sandford Road by boat had to bend their heads to pass under the telephone wires. At the height of the flood, water level was half-way up the Major Mitchell Monument on the Sandford Road. It was many weeks before the debris was cleared and homes made habitable again. Notes compiled by the Secretary of Trustees from the Trustees' Ledger. Received from Mr T. Cawker, Mr. J. Little, Mr. T. Graham, Mr B. Dancocks, 5/- each for the right to train one horse each for 6 months on the race-track. To Mr John McSheehy, for making and brushing fence for hurdle race, �1/-/-. Mr. Scott, Engineer, Casterton-�1/11/6. Being half amount of his charge for preparing plans and specifications for the racecourse. Mr. J. S. Anderson, Secretary. Mr. J. F. Cull for 5� days' work at Reserve, �1/18/-. From W. A. Cross, Galvanised Tank and Stand for same, �2/l2/6. J.F. Nicholls, for 33 Fencing Posts supplied, 16/6. A. Gasperino, for 1 day's work filling holes on Track near dam, 5/ -. Received from the Secretary of Football Club as percentage of first match for the Medals, 8/-. 1 Coil No, 10 Galv. Wire - 14/9. Racing has always played a prominent part in the lives of the Sandford Community and in the very early days, the highlight was a cross-country steeple-chase that carried a prize of �150. The race, which finished in what is now Main Street, attracted noted riders from Western Victoria and the S.E of South Australia. Adam Lindsay Gordon, poet, once rode in this race, but was unsuccessful, the winner that year being Ned Gorry. The Racecourse, now occupied, was once part of a common, but was gazetted as a Racecourse and Recreation Reserve in 1895. The Plans and Specifications were prepared by the Shire Engineer, Mr. Scott. Racing commenced in 1887, this being a registered meeting, held annually on Boxing Day. Amongst the earliest trainers to apply for permission to train horses on the course were Messrs. Cawker, Little, Stock, Graham and Dancocks. The fortunes of this sport have fluctuated over the years, but at the present time, an enthusiastic club is on the way to making Sandford one of the most popular Picnic Courses in Western Victoria. This most popular sport was commenced early in the century, and the first organised competition in which Sandford took part was between teams from Hamilton, Casterton and Merino. Practically all the travelling in those days was done in special trains, and most of the population would make it a day. When writing on early football the first name that comes to mind is that of Paul Warren. Paul, who was a raw-boned youth when he started playing for Sandford, later joined Essendon, and became one of the most polished players in the Melbourne League. Over the years, Sandford Football Team has won many premierships, and at the time of writing were again successful this season. The Sandford Rifle Club was formed in 1910, the joint secretaries being Fred Grills and Ben Whyte. This club had a strong membership and produced some excellent rifle shots. 26 members enlisted in the first World War. Competitions were enjoyed with neighbouring clubs until the outbreak of the second World War when all the rifles were called in. In conclusion we hope that all who read this little book will treasure it, and perhaps at some future Back-To", those who are now active citizens will be remembered in a like manner. Our pride in our town is expressed in our service to our little community. May we hope that all who return to share in this I celebration will be enriched by the hand of friendship, and the renewing of old acquaintances in the journey down the path of memories.